As I was feeding Niko barley cereal with a dash of prunes this morning, I had to do a double take when I thought I caught a glimpse of a second tooth. I couldn’t be sure, but upon further inspection my observation proved correct: a second tooth had sprouted up right beside his first one. It seems that the Tooth Fairy cast her spell in the overnight and Niko woke up with tooth numero deux today. I say teeth, and teeth they are, but they are still super tiny, probably only about 2 mm for the first one and even less for the second. Furthermore, these elusive little teeth are proving difficult to catch on camera, but pictures will be posted as soon as I can get a clear shot. So, when are we supposed to start brushing this little puppies? PS – I am aware that the Tooth Fairy is usually the one who takes teeth away but in this case, I swear she’s the one who dropped them off. 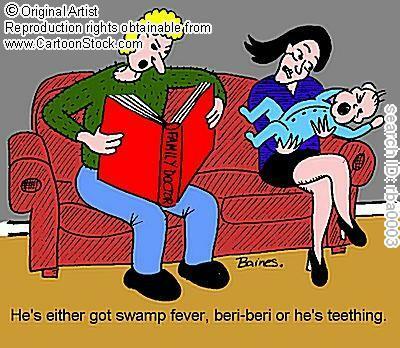 Note: Contrary to the cartoon below, Niko does not seemed to be bothered by teething. The only sign he shows is a steady river of drool. 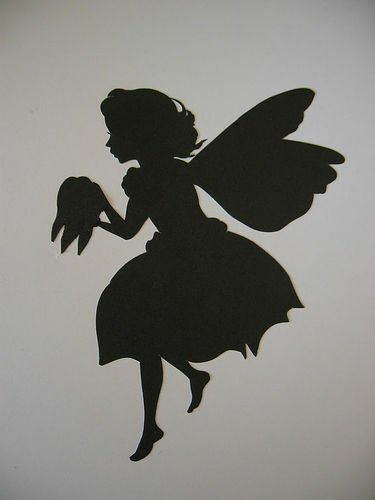 4 Responses to "The Tooth Fairy Strikes Again"
Their teeth come in so mysteriously don’t they? They’ll teeth for weeks/months then all of a sudden it’s appeared. This Mom’s Guide to Caring for Little Teeth (http://www.1dental.com/moms-guide/) has given me some practical tips on keeping my boy’s teeth clean and healthy.